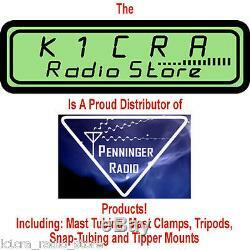 Penninger Radio 10' x 2 Aluminum Mast Tubing Kit. 10 Feet Overall Includes TWO, 5' Tubes and One Joiner Clamp Penninger Part Numbers: AT-2000-125-5 and MC-200. Yup, it may seem more expensive but Penninger Radio products are built to last with high quality materials and parts that are unique in every way! With this package, you will receive two, 5 foot mast sections and the amazing, MC-200 mast clamp to join them. The mast has a 2" outside diameter (OD) and a tubing wall thickness of 1/8". It is all aircraft grade aluminum and the hardware on the clamp, all stainless steel. Use this mast to support radio antennas or weather stations. Ideal for elevated photography as well! If you are building an antenna, this tubing makes a great boom for beam / yagi antennas too! The MC-200 is designed to join the two sections perfectly. Penninger Radios' unique design ensures the clamp perfectly mates with the mast, preventing the tubing from being damaged or crushed. A centering hole is provided so you can insure the mast sections are perfectly centered in the clamp. Guy holes are provided as well should you need guying for your application. Penninger Radio designs all products for commercial applications but with the Ham in mind too! With proper use, it will last a life-time. Two AT-2000-125-5, 5-foot Mast Sections. One MC-200 Joiner Mast Clamp. We also offer a full line of tripods, Tipper mounts, drive-on or stake mounts and wall or post mounting brackets to support this product. 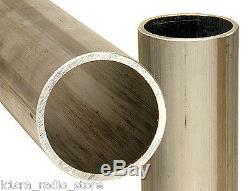 We can also provide this tubing by itself, or in other lengths. 1.5 OD versions are available as well. By purchasing from this listing, you are agreeing to the following: 1. We do not intentionally sell items that are not in stock and appreciate your understanding if we can not provide an item we have for sale. We want you to pay the least possible price and we can't do that when we have to share our profit with someone else! It is offered as an alternative to help keep your cost down. We promise to discuss and mutually resolve all problems or mistakes immediately. The item "Penninger Radio AT-2000-125-5 10' by 2 OD Aluminum Antenna Mast or Boom Kit" is in sale since Monday, July 3, 2017. 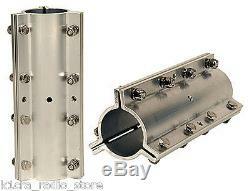 This item is in the category "Consumer Electronics\Radio Communication\Antennas\Ham, Amateur Radio Antennas". The seller is "k1cra_radio_store" and is located in Hamburg, New York.